If you are extra lucky, you’ll be drinking one of these green shakes for St. Patty’s Day. And you’ll be feeling pretty good too. If you’re unlucky, you’ll be swamping your diet with green beer (gross). My friend just informed me that last year she was in Ireland for St. Patrick’s Day. Although it’s more of a “touristy thing” over there, that makes us feel a little unlucky here, stuck hanging out in North Philly. But I bet they don’t have refreshing Pineapple Cilantro Lime Smoothies over in Ireland. Meanwhile, my refrigerator currently does. How’s that for living in the ghetto? I’ll take it and let myself feel pretty lucky again too. 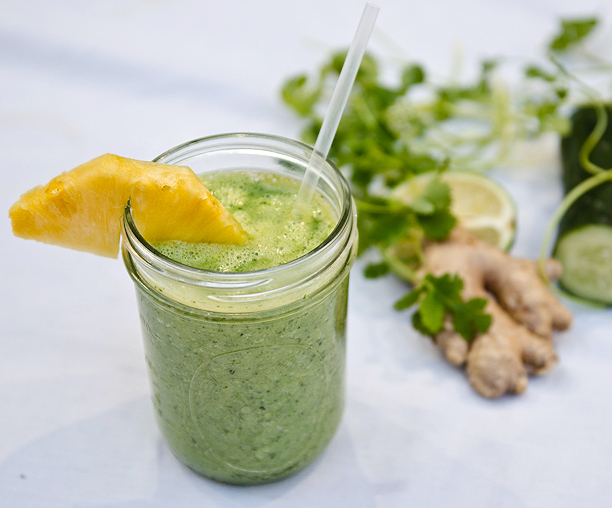 This is a palate-cleansing, energizing smoothie perfect for days where you’re looking for something on the lighter side. It’s packed with refreshing flavor that adds a nice variance from traditional fruit-sweetened smoothies. Plus, it’s got a little silken tofu for a creamy touch of protein that will keep your tummy satisfied. Serve for breakfast or lunch, or as an after dinner pick me up, and if you’re smart, serve it tomorrow for St. Patty’s Day. Serve with a few chunks of freshly diced pineapple. Awesome – green beer sounds disgusting… I want one of these – I’m loving the funky looking smoothies around at the moment. Well, my plan today at work is to make green smoothies. I’m so tempted to use this recipe!!! I will definitely write your name and blog on the recipe if I do. This sounds AWESOME!! Pineapple and cilantro- Now those are a pair I would not have put together. Of course, cilantro does taste like soap to me, but I’m betting that parsley would make a fantastic substitute. I’ve gotta try it! The scoop: Wearable Fitness Tech | Move your Assets!